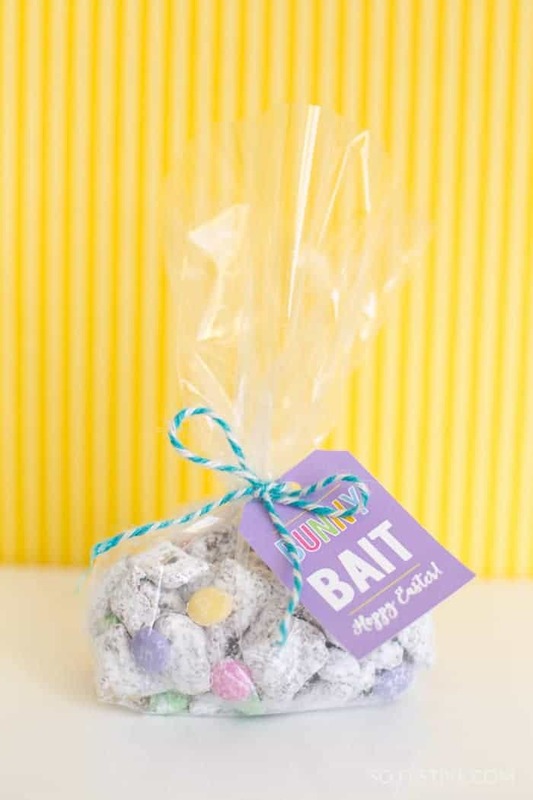 Bunny Bait Muddy Buddies Easter Treat - Simple Easter Ideas- So Festive! Easter + Muddy Buddies = Bunny Bait! This cute & simple Easter treat is perfect for Easter parties, gifts, or an easy snack to make with kids! Easter is such a fun time of the year! Spring is in bloom. Fun family Easter traditions await. But, it can be a busy time, too! 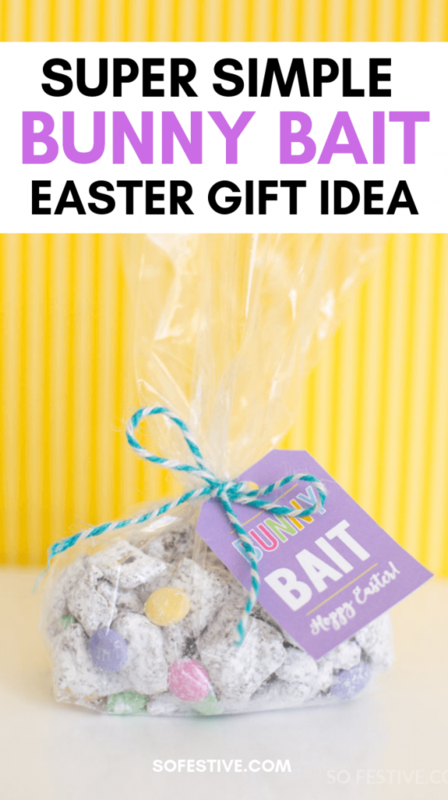 If you need an easy Easter treat that can be made quickly, try Bunny Bait. 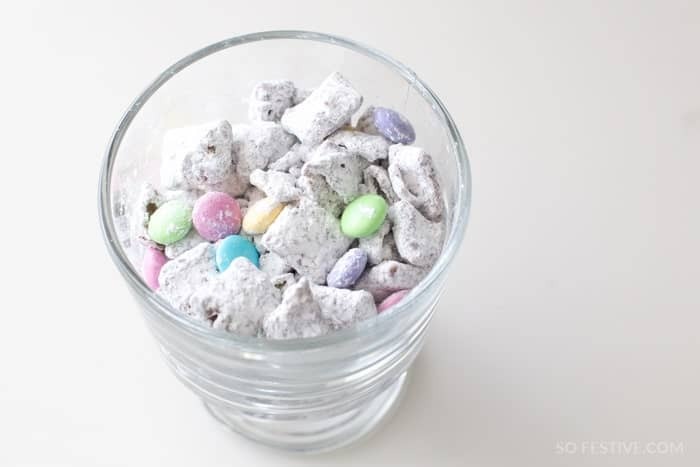 Chances are you’ve had Bunny Bait before… you know the classic Muddy Buddies recipe? To make Bunny Bait however, you’re going to tweak the recipe just a little to make it festive for Easter! Don’t worry, this Easter recipe is quick (under 15 minutes to make) and easy enough for kids to help you. You’ll find the full recipe with directions below. But basically, you’re going to melt the chocolate chips, butter, and peanut butter together. You can do this in the microwave or on the stove. If you want to save time, the microwave will be much quicker! Then you’ll stir together the Chex cereal with the melted goodness. And then shake powdered sugar on top. Don’t forget to sprinkle Easter M&Ms on top! Serve it straight from a bowl, or package it up for cute little Easter gifts. Use clear cellophane bags to package up the Bunny Bait. I always keep a big stash of these cellophane treat bags on hand for gifts like this! 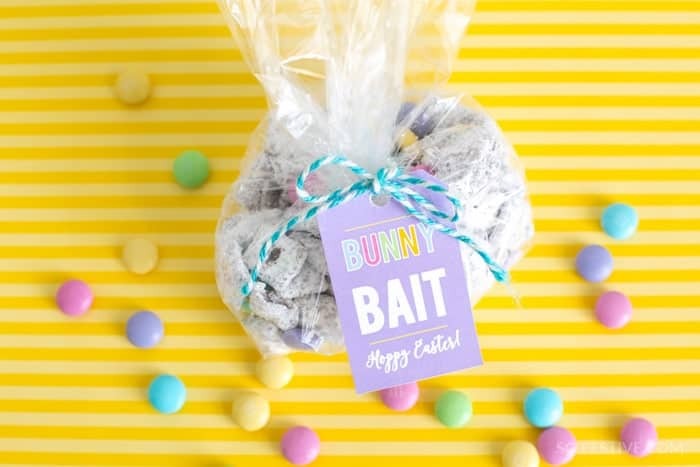 Tie with baker’s twine and attach the Bunny Bait gift tag. These adorable Bunny Bait Easter gift tags are available in our Freebies section. Just print, cut and attach them to this fun Easter treat. Use them for a simple gift, party favor, or little gift for teachers or friends. Pin this idea for easy reference later! In a large bowl, measure the Chex cereal and set aside. In a microwave safe-bowl combine the chocolate chips, peanut butter, and butter together. Melt in the microwave on HIGH for about 1 minute. Pull out and give a good stir. If the mixture is not quite smooth, microwave about 30 seconds more. Once smooth, stir in vanilla. Pour over top the cereal. Stir gently until all covered. Place the cereal into a 2 gallon zipper-closed bag. Add powdered sugar to bag. Zip tight. Shake until all pieces are covered. Add more powdered sugar to make the treat more white. Sprinkle Easter-colored M&Ms on top.